About 4-5 months ago I gave up buying White Dwarf Weekly as I found it had very little in it that I was interested in that I couldn't get elsewhere for free. Over that time I haven't really missed it. 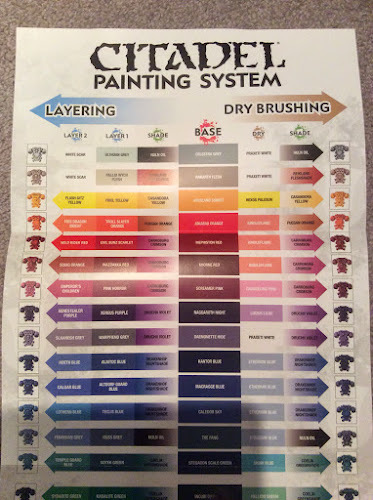 What it provides is a quick guide to what Citadel colours you use to either highlight or drybrush up from the various base colours. While not earth shattering I think it is very useful quick guide if you use the GW Citadel Paints - which I do. The use a SM backpack to show the finished effect. The various technical and texture paints are covered at the bottom - and of course they spruik their new brushes. 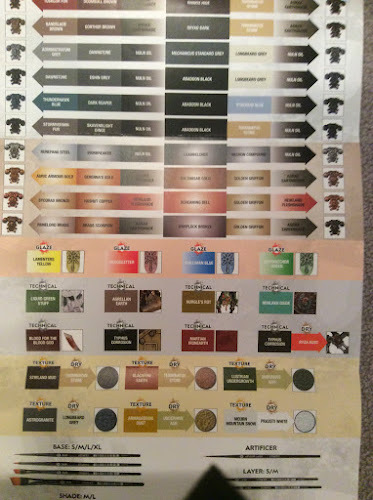 From my POV it is a very useful chart to act as colour reference - all for the cost of WDW. If you want one though, be quick. This week's issue disappears tomorrow night. Don't lie Peter, you bought it for the Knight Warden rules.